Gouldian finches (also known as the Rainbow Bird or Lady Gouldian Finch) originate from Australia and are members of the finch family, which includes sparrows, cross bills and gold finches. Gouldian finches inhabit the open Savannah regions of northern Australia. In hot climates, Gouldian finches protect themselves from the sun's rays by perching under the vertically hanging foliage of the eucalyptus tree. Their diet consists of varieties of seeds, live food and rock salt. They produce four to six eggs during each mating cycle. The eggs emerge approximately one every 24 hours. Full feathered fledglings should appear after 22 days. Naturalist John Gould and his artist wife first discovered Gouldian finches while touring Australia between 1838-1840. 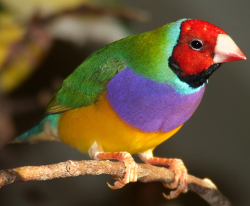 His wife died on their return to England, and Gould honored her by naming what he considered to be the most beautiful bird after her: Lady Gouldian Finch (Amandina Gouldiae). In 1887, the first black-headed and red-headed Gouldian finches were imported to England where they created a sensation. When ViewSonic Corporation founder James Chu decided to develop and market computer monitors, he recognized the need to develop a powerful brand image - one that would denote superior quality and value. He also understood the advantage of creating a distinct, eye-catching visual identity able to instantly communicate such attributes as brilliant color and sharp resolution. He believed that having a strong aesthetic appeal was particularly important for monitors, since they are the personal computer's most conspicuous component. Working with a trusted marketing advisor, Chu began searching for a logo or symbol that would achieve these objectives while projecting friendliness and comfort. The three Gouldian finches that form the ViewSonic logo have become a well recognized symbol of excellence. ViewSonic strives continually to ensure that customers around the world associate them with the attributes that characterize the company - superior quality; beautiful, vibrant colors; appealing warmth and friendliness. These birds have become a symbol of ViewSonic and we have a special affinity for them. We have become sponsors of Lady gouldian.com's adopt a bird program. To adopt one of these wonderful birds or learn more, click here.